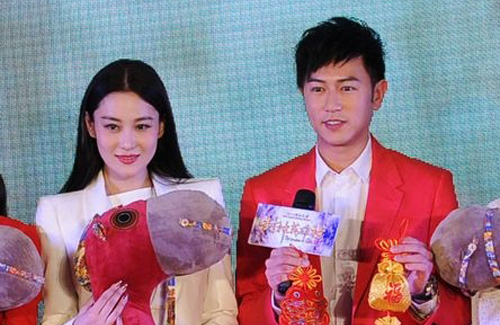 The cast of mainland Chinese drama The Investiture of the Gods <封神英雄榜> attended a press conference in Beijing to promote the fantasy series, which premieres in Guizhou, Shandong, and Hubei on January 31, 2014. Helmed by Taiwanese producer Jerry Chien (簡遠信), known for his fantasy drama productions in China, The Investiture of the Gods is loosely based on the classical Chinese novel of the same name. Sammul Chan (陳鍵鋒) stars as Jiang Ziya, a magical military strategist who helps the king overthrow the Shang Dynasty of Ancient China. Unlike previous portrayals, Sammul will play a younger version of Jiang Ziya, who is traditionally known to be an old man in folklore. In the series, he will transform into an old man after going through a terrifying marriage experience. Viann Zhang (張馨予) stars as Daji, the favorite concubine of the last king of the Shang Dynasty. Her first duo role, Vianna will also be portraying the evil fox spirit, Hu Xin’er. The all-rounded drama will feature various themes, including fantasy, suspense, and romance. In September of last year, Viann boldly announced that she had broken up with Li Chen (李晨), her boyfriend of one year. Since the split, rumor mills spewed that Viann and Li Chen were reconciling and were living together. Having already denied the rumors several times in the past, Viann clarified once again that she and Li Chen have gone separate ways for good. “It is not true. I am living in my own house. I am single and am enjoying acting,” Viann stated.